cyberREN is equipped with an advanced medication ordering facility which ensures that nursing staff are alerted and informed of new orders as they are generated. Medications are ordered from a comprehensive, pre-populated, user definable catalogue (formulary) with a minimum of effort, and may be quickly modified by physicians from several convenient locations throughout the cyberREN medical record. Medications may be included on user defined flowsheets, and dosages may be trended against laboratory results to display outcomes graphically . 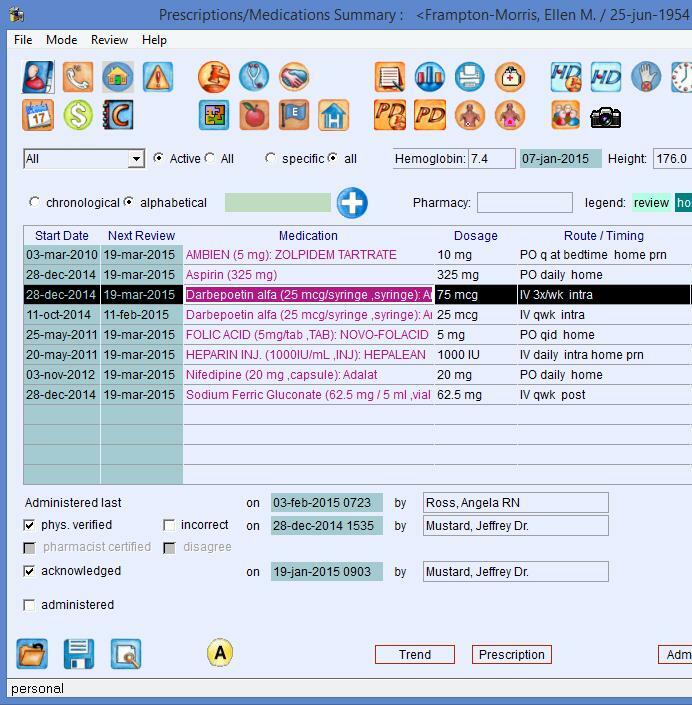 Medication orders may be flagged as being session related, with only session related medications showing automatically as alerts in cyberREN's Hemodialysis Session Charting function. The administration of a session related medication is charted very quickly using a point and click technique. .A standing medication order may be completed many times, until the medications end date, at which time the order may optionally be deactivated automatically by the cyberREN system. The administration of all billable medications is automatically captured by the cyberREN system and forwarded to a billing function - financial capture is a byproduct of regular clinical charting, and does not require any extra steps. Medication orders may be trended i.e. presented graphically over time, and compared with related laboratory results. cyberREN can list all patients receiving a certain medication; the generated list of patients can further be qualified by selecting a laboratory result criteria.